This is a guest post by Bertrand Godfroid. We watch in fascination as the most elegant of paddle steamers approaches it’s moorings to pick us up. Seagulls flap away as it gives a long, loud and steamy blast on its foghorn. We step on board. We are greeted by that delicate and unmistakable mix of fragrances of cool lake water, varnished wood and engine oil. The setting sun catches the glasses and bottles of a welcoming little cocktail bar. 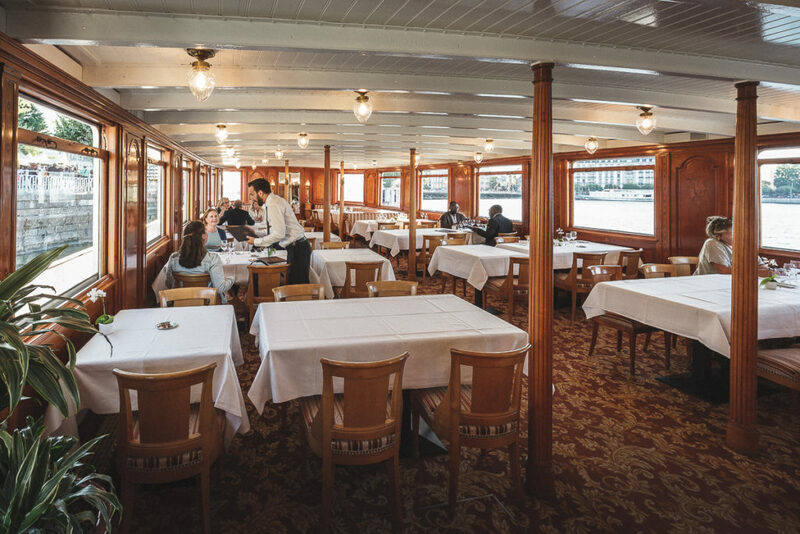 The restaurant that will soon fill with our fellow passengers is all linen tablecloths and glistening cutlery. If one is looking for for a film-set fantasy romantic interlude, there is nowhere that better fits the bill. 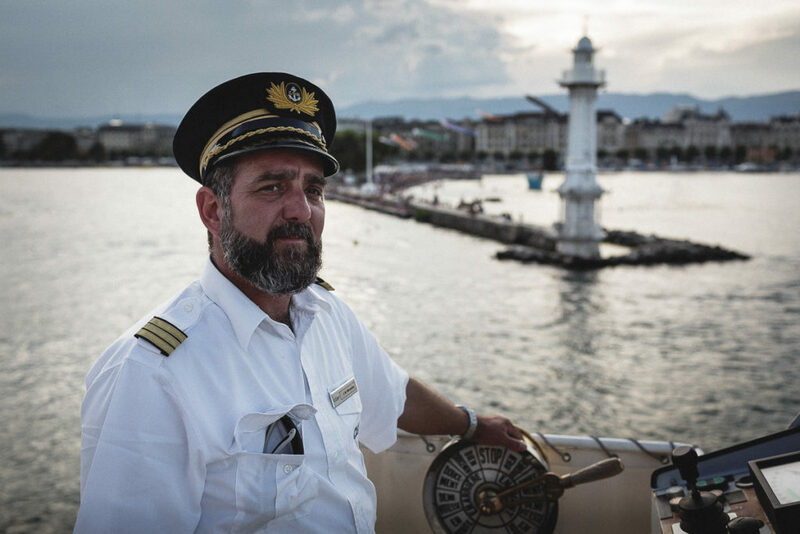 We are welcomed warmly by the captain, 48 year-old Jean-Martial Mercanton. He has been in charge of this vessel since 2012. He follows in his father’s foot steps. He describes his working day and responsibilities with unfettered enthusiasm and tells us the most satisfying part of his job derives from sharing the country’s heritage with others. His only headaches come from the unpredictable weather, especially the famously vicious storms that barrel up the Rhone valley from warmer climes to crash into and over the nearby Alps. This is a man who loves his job and, by all accounts, looks after his crew. The Savoie, has to be high on any list scoring bygone nautical elegance and Captain Mercanton is rightly proud of his charge. It was built in Switzerland in 1914. 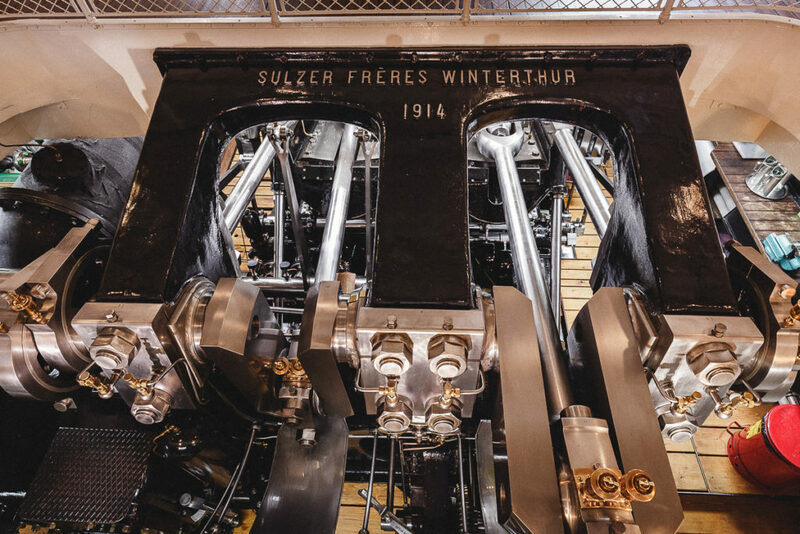 The massive 900 horsepower high-low pressure cylinder engine was originally powered by coal. This was converted to oil in 1962. 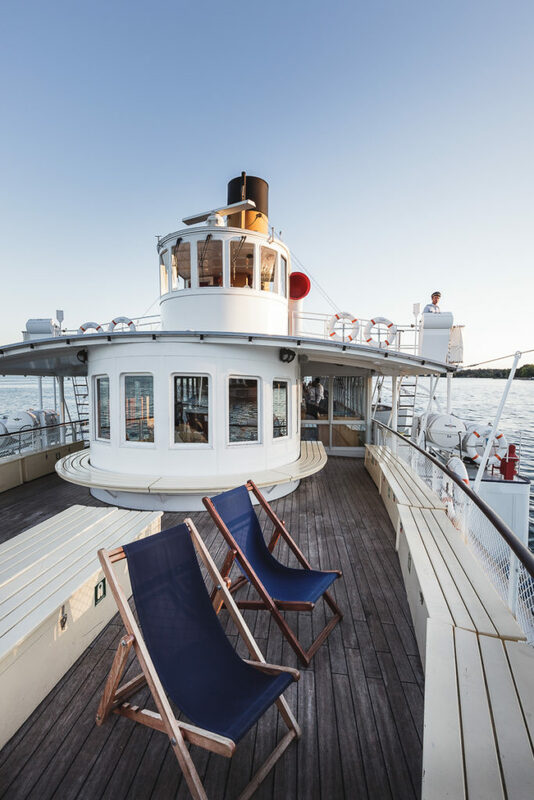 Amazingly, the boat only underwent its first full renovation in 2004. 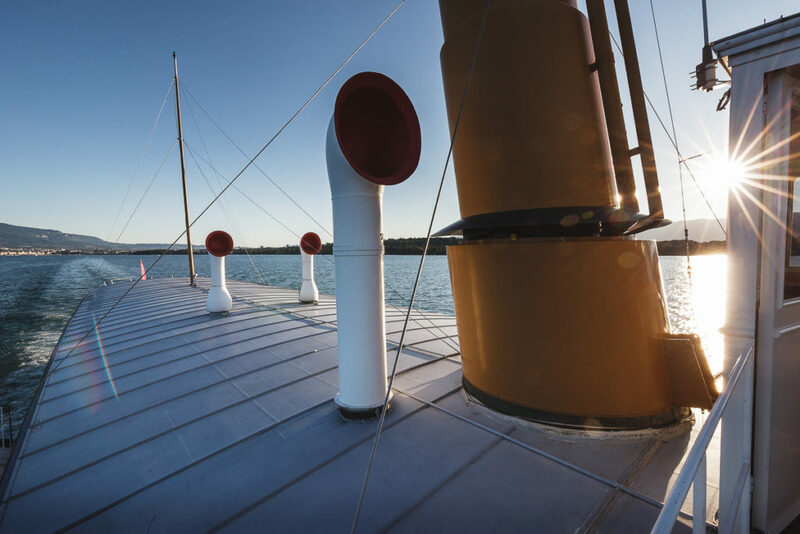 What’s more, this vessel is only one of eight of the CGN’s fleet of truly beautiful “belle époque” paddle-steamers. The engine room is open to view from the middle deck. It is mesmerising. It is all massive shiney whirling oily piston pumping power kept in line and running by engineer Yan Umberti and his team. The engine room tour is mesmerising. We stand amidst it all just grinning like school kids. This is so much fun! Twenty-five year-old Yan’s job is to keep the whole thing fired and lubricated ; he is never still. He handles the massive set of levers and controls with practiced ease taking his orders from Captain Mercanton the old-fashioned way by verbal orders. Between filling oil cylinders, checking steam and furnace temperatures he is happy to chat. Yan patiently explains how the steam is produced from 16,000 litres of lake water, heated to 108 degree C, circulates through the two cylinders that drive the main shaft of the paddles and eventually exits having been mixed with lake water. We ask him if they have ever had a crisis on board. He tells of a day when there was a genuine engine failure with passengers on board. He was able to scavenge a part from another boat and run a temporary repair. The cruise finished albeit a little late. I note he refers to the engine as a person. Does he or she have a character? “She certainly does!” responds Yan. “She can be unpredictable. Sometimes the cylinders seem to get a bit out of synch and sometimes she just plays up and we don’t know why.” “Does she have a name?” I ask. “Yes, Josephine!” I ask where he will be in ten years time. “Right here! With Josephine!” he replies with a huge smile. 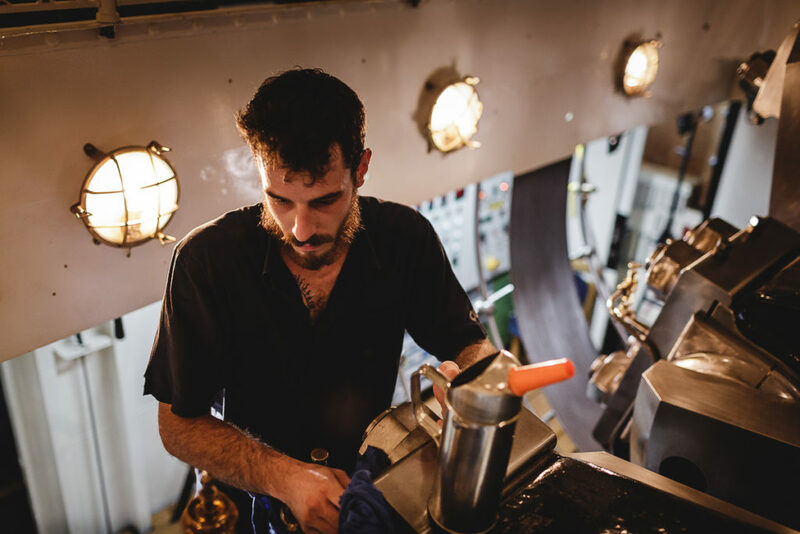 Drenched in perspiration from the 55 degrees in the engine room, we go up to the upper level and order a cool drink. The sun has almost set whilst in Yan’s domain. We are invited to look at the dinner menu and decide on scallops and delicate mushroom raviolis washed down with a fine local gamay. Lightening strikes on distant mountains as we cruise slowly back down the lake. I am overcome with a feeling that all is well in the world. Very well. 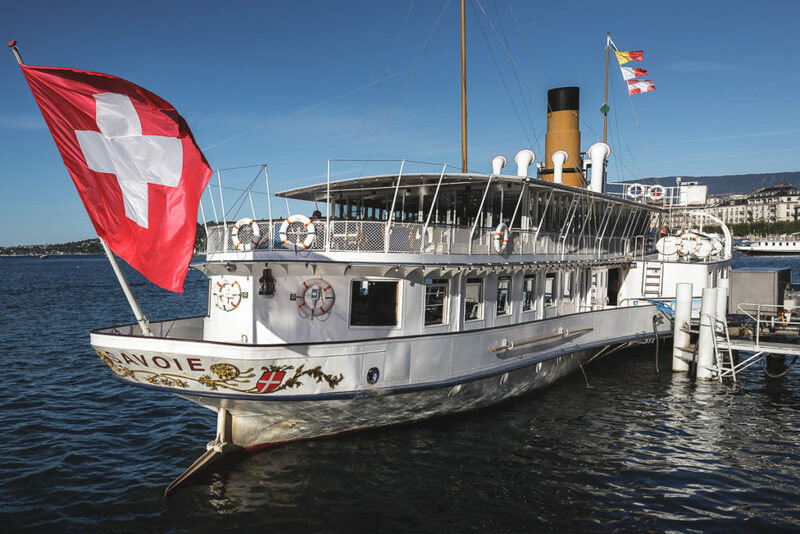 If there is one thing you should do when visiting Geneva, it’s to take a cruise on Lac Leman aboard the Savoie. In the meantime, take a look at some more pics of our cruise. This entry was posted in Design, People, Public places and tagged Geneva by Guest. Bookmark the permalink.